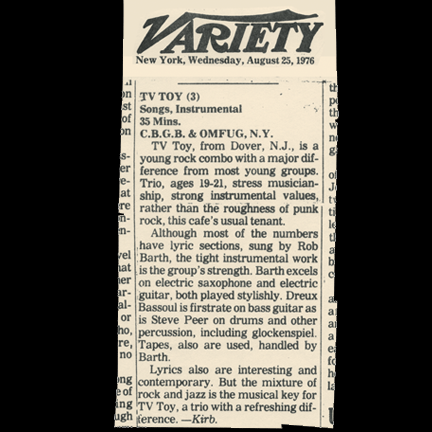 It’s hard to write about TV Toy without injecting myself into the story. Even though I didn’t come into the picture until the mid-point of the tale, I still feel a close affinity to this band that 20+ years have never been able to erase... especially after having the opportunity to revisit (and remaster) the recordings compiled for this CD. Back when it was happening I knew I was witnessing authentic rock and roll with a brainy “prog” edge, an ultra-modern post-suburban attitude. But now what I hear is great musicianship mixed with true passion and commitment. It was, and is, heartbreaking that not enough people ever noticed. Maybe this compilation can change that a little. For all my closeness to these tracks, I’m not really qualified to be a TV Toy historian, my knowledge of the first five years being sketchy at best. 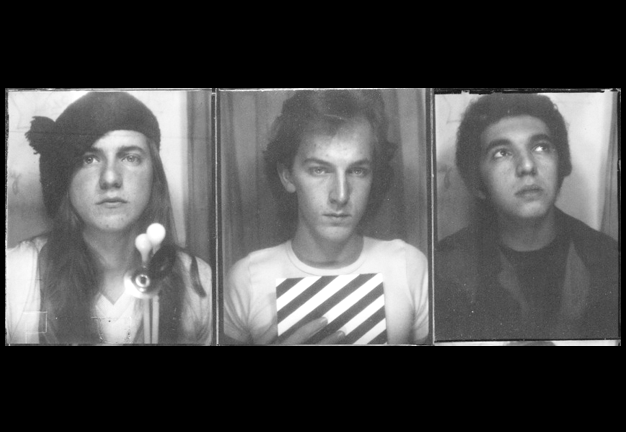 I know that Rob, Steve and Dreux formed the band in 1975 at William Patterson College, a middle-of-the-road school in northeast New Jersey about 20 miles outside of Manhattan. 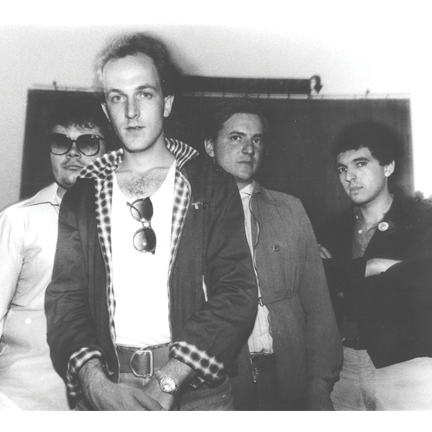 By 1977, New Wave was overtaking the New York music scene; Steve was an occasional drum roadie for Billy Ficca of Television and was getting TV Toy gigs at lower Manhattan venues like CBGB’s and Max’s Kansas City. 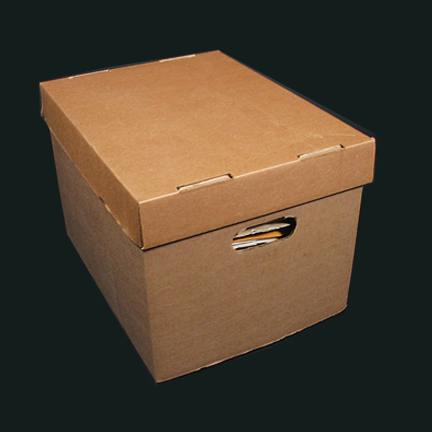 When composer/producer Mark Abel heard the band at CBGB’s, he was impressed enough to bring them to Vanguard Studios (headquarters of the venerable jazz label), where he produced the demos that start off this disc. 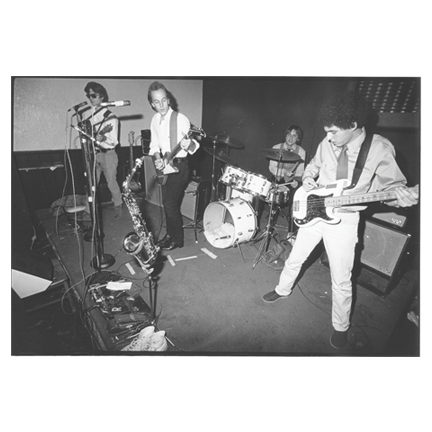 The resulting tracks (engineered by Brooke DeLarco, who also crossed paths with the band at CBGB) are raw, ambitious, jazzy, English prog-influenced, but with a unique sonic and lyrical outlook that would define just about everything that was to come. 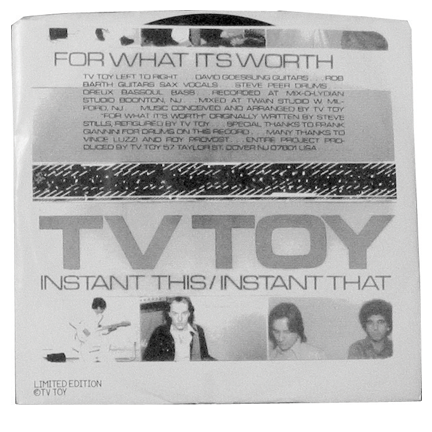 In 1978, Dave Goessling joined the band, adding two-guitar interplay, shimmering chords and sophisticated licks that sent TV Toy soaring in live performance. 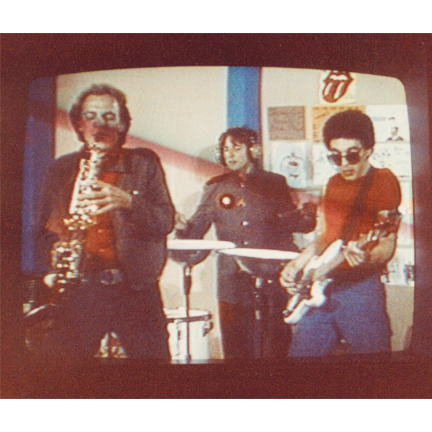 But then, just as they were about to record their first single — a remake of Buffalo Springfield’s “For What It’s Worth” — Steve had the opportunity to join Bill Nelson’s Red Noise for a UK tour in early ‘79. So the record was made with Frank Giannini of The Bongos sitting in on drums. 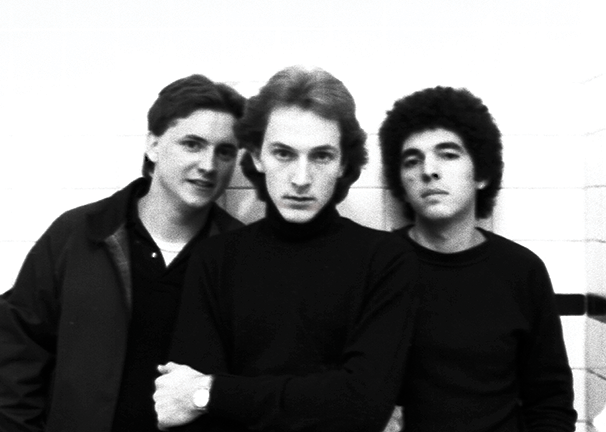 At least Steve managed to get it played on BBC Radio 1, and after Red Noise imploded, he returned home to the band, obviously energized: just listen to the live tracks from the fall of 1979 recorded at the Showplace in Dover, NJ (TV Toy’s home town). They’re ample evidence of the power of this line-up, as is the prog-metal crunch of the “Monopole” demo, recorded during this period. 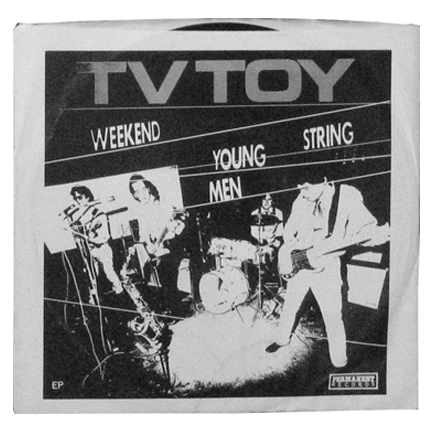 The band continued as a trio, even shortened its name to TVT for a while, but by the time I met them at the Stanhope House on Valentine’s Day, 1980, they were back to being TV Toy. 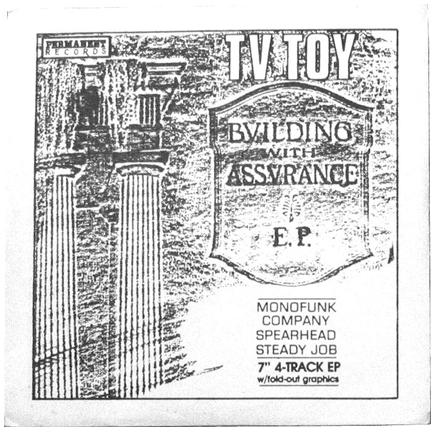 Not long after that unforgettable gig, they were in the studio creating the “Building With Assurance” ep, which included “Spearhead,” “Monofunk,” “Steady Job” and the title track. Longtime friend Bob Solberg was invited to guest on some tracks, and soon became part of the line-up for good, contributing a meaty second guitar, synthesizer, and vocal support on tunes like “Rebound” and “Boy’s Life” (released on a promo cassette of live tracks recorded at the Showplace). By this point, the New York gigs were getting few and far between. But with a loyal local following intact, the band wasn’t ready to give up, and went to work on another single. 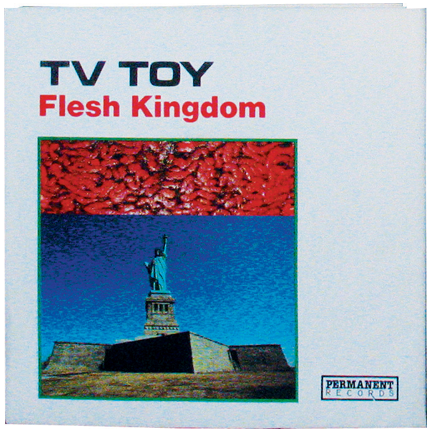 “Flesh Kingdom,” written in the 60s by Rob’s brother Billy, was given an irresistible new wave-metal treatment; the b-side, “Something Special That Lasts Forever” was wishful thinking I guess, because it turned out to be neither. In the fall of 1983, they returned to the studio one more time to cut “How Cruel,” mixed two different ways: with a sax solo and the spoken word piece heard at the close of this CD. 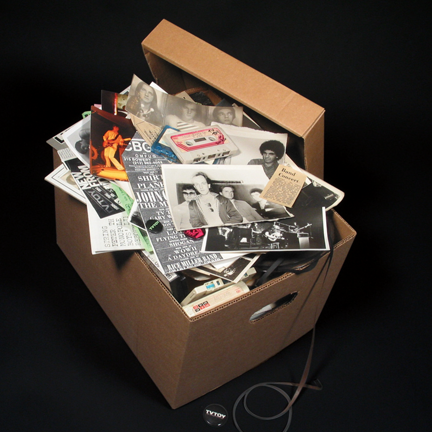 In the end, the guys decided to scrap it altogether and use “Boy’s Life” for inclusion on a Trouser Press flexidisc... though by the time it was published in the March 1984 issue, Steve was already hunting for property in Maine, Rob was busy getting his graphic design business off the ground, Dreux was writing songs and running a macrobiotic/nutrition practice in Hoboken, and Bob had moved on to other musical pursuits. TV Toy was no more. To me, the three most important words on that track are “Get It Done.” That’s the TV Toy ethos I’ve taken to heart, the philosophy that’s carried me through countless projects over the past 20 years... including this one. Now we’ve got it done. Maybe that’s all that really matters.